I totally agree with you and should have added that I did not in the least intend to minimize your ideas. Your design just reminded me of Minskleip's post. By the way, CeeSA has also implemented an impressive split keyboard with two 12x8 Tipro units. It seems like this solution is quite fit for Tipro units, since they check all the marks: ortho layout, programmable, and can be combined. 2. to take keyboard ... INTERNAL NOTES, using something like the most minimal ex (line oriented) editor commands (those familiar with ed, or ex and/or vi(m) know what I'm talking about) and some form of storage (ideas?). This is a genius idea! Except for profiles, you would have to have a base set of every profile you'd want. I don't know how well the 2-part assembly would work with shorter stuff like gmk cherry profile or DSA also. It's a neat idea though. Maybe the keys could somewhat be sticked together with magnets? A keyboard with over 200 keys, that way there is no need for layers. I am thinking something like 2 keyboards. 2 home row positions. Adapt a (more solid) two-pieces, wood-made, foldable chess table to make a keyboard case out of it. 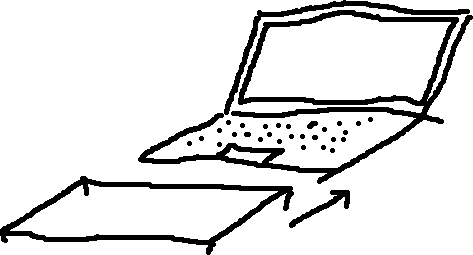 I'd like something which I can slide over a laptop keyboard and provides a stable stand for my HHKB. A piece of wood, or something 3d printed, or maybe a frame, ideally something which can be folded or slided into something smaller for transportation without sacrificing on stability. Maybe with stops or holes to keep the HHKB feet in place. Of course it all depends on the laptop size, but on my old Toshiba Satellite, the HHKB fits perfectly, in that I simply put it on the laptop keyboard without problems - I can use it, and it's pretty stable as is. If the laptop isn't larger than the HHKB, two strips of narrow rubber stuck to the margins of the HHKB's bottom could also help with more taller laptop keycaps. That's great! For a programmable keyboard, this could (depending on spacebar length) replace a number of 1 unit switches with, well, the spacebar, by re-using the most distant two switches positions (both probably modded with very light springs). So I recently managed to put my hands on a FC660C (thanks to Wazazaby). Great keyboard! More silent than the HHKB, somehow more tactile and heavier domes (although rated at 45g), sturdier due to the plate, arrows ... - and, soon, fully programmable too. After this memorable thread necromancy just to show off, let's get to the great idea of the day. Laser wrote: ↑ I suggest to start a new thread (this one! ), in order to collect the eventual occurrences of keyboard-related GENIAL, ORIGINAL (or SILLY/FUNNY, or both) ideas that members of Deskthority may feel lurking in their heads, waiting to be formulated, and pestering their owners if they don't. Weeeeeeeeeeell... now that you mention it... every now and then I design a joke layout (like the "monitor keyboard", which was supposed to have exactly 132 keys), and then some of my ideas are part joke, part serious. Lately, I've been researching ortholinear keyboards, and I've noticed that they are small — discounting proper keypads, ortholinear keyboards come in simple monogrids, sized from 12×4 to 16×6. And I thought... why not do clusters? Why not do an ortholinear keyboard with a recognizable nav cluster, a separate F-row and whatnot? So I designed an ortholinear TKL layout (the numpad can be easily tacked on later)... now I wonder if it would be a good idea to actually build it (I WILL do a SKB60 ortholinear first, because I really need to test if I can actually use non-staggered keyboards). A proposal for an ortholinear TKL. The main alphanum block is 14×5; it's accompanied by an Esc+F-keys row, and a traditional nav cluster. I DO wonder if I should make the main block 15×5, make both LShift and LCtrl 2U wide and then enjoy three extra keys. Why is Alt and Ctrl so large? Why is left Ctrl so small? Because I wanted to and that's that! Because in my design I wanted all keys to be 1U or 2U and I wanted the mods to keep their position relative to the rest of the keys as closely as possible to a regular staggered keyboard. This meant that Alt, AltGr and Ctrl had to be rounded UP from 1.5U to 2U (note that RShift is reduced from 2.25U to 2U); OTOS, (ISO) LShift being rounded down to 1U isn't too bad, and LCtrl rounded down from 1.5U to 1U isn't that painful of a compromise because it stays in its "natural" position on the lower left corner. This allowed me to reduce the initial width of the main alphanum block from 15U to 14U, as well... something that I now wonder if it's truly necessary. I could make it be 15×5 again, make LShift and LCtrl 2U wide (for "consistency"), and then add three keys on the remaining space. What to do with those three extra keys? The middle one could be Shift-Tab. Or programmable macro keys. Or Fn keys. Or I could add another 2U Enter key ("West Latin Enter") and make the top left corner key be an extra Backspace "for symmetry" (or Del, for that matter). depletedvespene wrote: ↑ Because I wanted to and that's that! ONLY if you give me 150.000 euros. Or 150.000 dollars, if you prefer so. Heck, give me 15.000 euros (90% discount! CALL NOW!) and I'll give this design whatever name you may want it to have. Anyone care to practically test this soon? Last edited by Laser on 30 Jan 2019, 18:15, edited 1 time in total. This may be unrelated but I recently swapped a ps/2 cable for an AT one to use my soarer converter on it, works great ! @Laser: that’s what I mean to do with my Filco MJ2 so I can use it with the iPad without simultaneously going insane. Sure there’s the Pegasus Hoof, but I’ve Teensies to spare and would like to socket the cable anyway. I’ve also gotten quite used to Hasu’s Unimap for programming now; and would like to add some of my HHKB tricks to the TKL. @Myoth - Yes, a bit unrelated, if I remember well the AT cable has a DIN5 jack, which has actually the same pins as a PS/2 jack (same pins, same protocol, different jack). The idea in the post above is to avoid using attaching a "USB host shield" to a Pro Micro and rely on the internal keyboard PS/2 capabilities instead, even if the keyboard normally uses USB So, using just a Pro Micro, instead of the more expensive/complicated "USB host shield"+"Pro Micro"
Have you done all that usb host shield stuff yourself? I looked into it a little when I first thought of Bluetoothing my Realforce, which is usb only. Host shields seem to be bigger than teensies! Yeah, I’d love to know how Hasu does it in those wee USB-USB converters of his. Or even better, I’d love him to make a Bluetooth version so we can all get aboard! Putting rotary encoder made from old HDD motor (so smooth). Problem is, don't see real practical application for those. I mean encoder can be good for audio editing (which nowadays I never do), or volume, rewind type purposes. But hey keys work well for that as well, and it's not something you do often.